In the previous post, I discussed automating the Content Migration using Talend. As the power of Talend lies with creating meaningful Jobs which solves a business problem. More often than not, one job has to talk to another job. 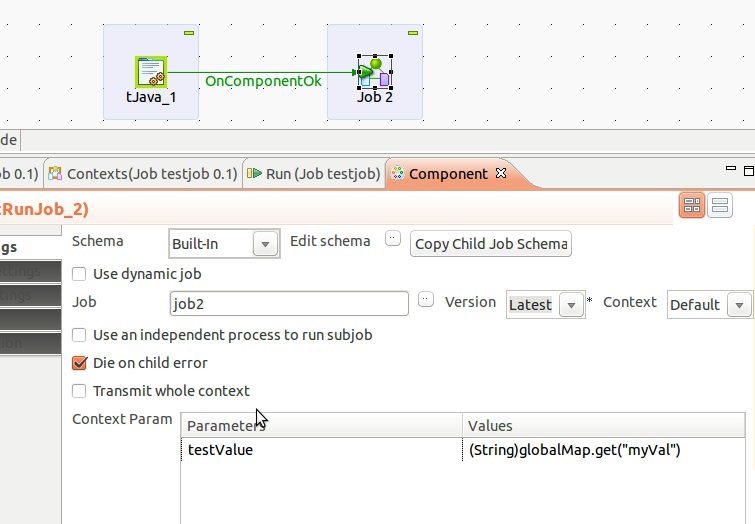 While working on a migration project, I had a use case where I wanted to pass a value from a Parent Job to a Child Job. and tJava_2 is trying to retrieve its value. Its value can be retrieved from the components defined in the same Job but if we try to access those values outside this Job, we’ll get the null value. To access the above value in Job 2 , define this component’s properties as below. Note the “Context Param” definition, this is how we can set the value in the context variable and retrieve it in the child job.